Close to the Rudower Chaussee, which runs across open ground, that is just opened up to building, a small piece of the last apartment buildings of Johannisthal away, one can see now the vomited into a thousand pieces of bones skeleton of the former airship “L 2” are in a meadow. High on rise the aluminium ribs of the tail piece, then follows in the long axis of the crashed ship a maze of twisted aluminum parts, some deep, deep drilled into the earth. The aluminum shines still white in its large mass and only at a few points one notice from the fury of the flames blackened parts. On this sad mess hanging here and there, the meager scraps of yellow balloon material, here and there, half buried, behold, a small utensil that is escaped by a miracle of destruction. Damaged fuel tanks are scattered all round, large boilers, which the ruinous explosive material has already poured. Three in the movement frozen wings of a propeller protrude into the air, another one has only kept one of his wings and stretches it ahead obliquely. Tiny things that are talking a terrible language, are still lying around on the thick grass ground: shiny buttons, cloth scraps, small gears, once the useful part of a large, now ruined work. In the afternoon there was the quiet road, which opens up the crash site, in a perpetual motion. Cars pulled out into long lines, at the sides families by foot with bag and baggage, with strollers and big baskets of bread. The crash site by police and military cordoned off a large square, surrounded by a wall of people. One lies on the grass, eating ones sandwiches and throws away the paper. Toils midst of the square is a small detachment of sailors, sorting the debris as possible. From the tangle of aluminum sheet is torn and cut out, which can be removed and taken away in baskets. From time to time one of the men roses from his arduous work and turns a little bit between the fingers, some tiny insignificant, perhaps a luxury item. But all this work is carried almost silent. Hardly a word is heard. The many hundreds who beset this place, speak very, very softly. Then occasionally drives a car through the locked room to the heap of rubble. Men who are members of the Commission of Inquiry and are welcomed by the naval officers who are to exercise supervision. The Secretary of War drives up and paces with his company slowly the debris field. At the point where she is laid low, is also the head of the airship, a conically curved, dented dome, a huge thimble, a metal dome not dissimilar. The weather keeps clear only in the evening autumn mists rise and the sun disappears in the orangered of the horizon, as a flying machine, the only today passes over the course in his tracks. Then the sailors are replaced and the crowd warps. the skeleton remains still. A few hundred yards away is the hangar. The Navy lag on its roof is at half-drawn. In the lobby lie the bodies of 27 victims. The guard of honor, men of the marine corps, are standing stiffly with bayonets beside it, with their helmets and chin strap. Outside the hall, everything is closed off to the most rigourous, no one will be let in, only see through the fence is permitted. Who wants to reconnoitre a dead, is shown a list. A very old woman stops over trembling in front of the sentinel. She speaks humbly a few words. She is shown the sheet of paper that contains the name of the dead. Suddenly she screams, reaching into the air and then collapses. Unconscious she is being taken away. A woman with a little girl held in hand is weeping conducted into the hall. Probably due to carburetor fire in the front engine gondola, the fuel tanks exploded, a huge flame set fire to the gas cells, and the next moment the air cruiser crashed to the ground. Today morning at 10 o’clock captain Freyer, the guide of the airship, wanted to make a test drive with the ship. The balloon that was filled only weakly because they wanted to keep a small altitude was brought out to the field. 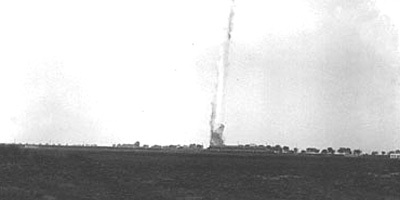 Duly rose “L 2” up to about 150 meters high, made a loop over the field and then turned westward to Britz to fly from there on over Berlin to Doeberitz. At the moment, as “L 2” crossed the to Rudow’s leading country road, a bright flame suddenly struck up in the front engine gondola. Like a rocket a fine strip of flame shot to the middle of the ship. Then followed a terrible explosion. 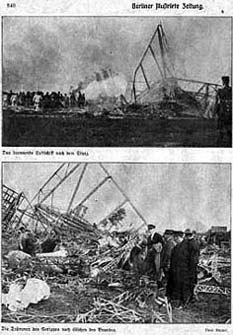 A crash, which cannot be compared to anything, and which was so strong that in every street of Johannisthal and even in the neighboring towns, as in Rudow and Treptow, all to the field located windows at distances of up to two kilometers were destroyed, then the airship burst. A huge flame shot 20 to 30 mtr high to the sky. The next moment they saw shapeless lump of iron pieces, canvas and rubber gear, and human bodies flying through the air. The bare aluminum skeleton continue flying some 30-40 Mtr through the air, because the motors were still working and the propeller were spinning. Then the wreck shot perpendicular to the floor, devastating what was still breathing. The citizens of Johannistal stood stunned at first. Then the cry of alarm flew through the village, “Help, the zeppelin has crashed!” Faster than it can be described, rushed hundreds of people in cars and bicycles with hatchets, axes and spades, armed to the field to help in order to to save what could still be saved. From the airport here, the cars were shooting up at full speed, each carrying 10, 12 men of the Marinedetachements that were already fitted with all life-saving equipment. The ruins gave a terrible, anyone who has seen it, indelible impression. At first glance, one saw nothing but a tangled towering to the sky mountain of aluminum tubes and frames, between which are inextricably thousands and thousands of wires dragged. The whole place was surrounded by thousands of onlookers, who densely packed, driven in breathless silence surrounded the picture of horror and desolation. All available policemen were only used to shut off in common with the sailors, the debris field by thick ropes. The audience followed the instructions without a murmur. Scheu wichen die Menschen zurück, die in den formlosen Leichnamen, die man an ihnen vorübertrug, Freunde und Bekannte, ja sogar Verwandte vermuteten und vielfach zu erkennen glaubten. Shyly the people receded, who in the shapeless corpses, which were carried past, friends and acquaintances, even relatives presumed and even in many cases believed to recognize. Technical Secretaries Lehmann, Prieß, Eisele. Fockon, Paethe, Machinist Petty Officers Weber, Fricke, Sailmaker Petty Officer Müller. Captain Gluud, Engineer Schüler, Technicians Hohenstein, Bauer. who had only participated as a guest at the unfortunate voyage. In total 28 persons have fallen victim to the catastrophe. The Naval Airship “L 2” was in a test drive ratio since its acquisition by the Navy and should rise 8 clock this morning for a brief, in the conditions of acceptance designated, altitude drive from Johannisthal. furthermore a captain lieutenant as commander student and an army officer as a guest. All in all 28 persons. To compensate the through the acceptance personnel of navy and shipyard caused excess weight, there were five persons of the normal crew and also the following items of equipment left behind: All outbord parts and the transmitter of the radio device, headlights and armour. Shortly after 8 clock in the morning, the ship was taken out of the hall and rised after careful testing of all parts, especially the engines, and after the exchange of a blasting machine in the rear pod at 10 to 16 minutes in the morning. It soon reached an altitude of about 200 meters. At 10 clock 19 min was observed by reliable people that during the first third of the front engine car between the car and the shell was a sheaf of flames arised, which first took the bow to the tip on fire. The fire spread quickly from the rear and destroyed the outer shell. For a brief moment, the rear gas cells were visibly uninjured, but were then also taken from the fire. In at most two or three seconds, the whole ship was engulfed in flames and an explosion was heard from about 700 yards away. At the same time the airship lowered and fell first horizontally, then slowly with the head inclined downward quickly to about 40 meters from the ground. Here a second explosion took place, which was, judging by the black smoke, probably stemmed from gasoline. When impinging on the ground a third, but weaker explosion happened. The skeleton came crashing down. 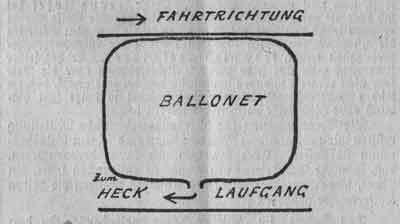 The ground crew of the Navy airship department ran at the double to the about 700 yards away, at Rudower Chaussee situated place of accident. Here, crews of a in the vicinity practicing pioneer department had already arrived. With these, the rescue operations have been started. Medical personnel were there immediately. After a short time appeared the fire department of Johannistal and several ambulance automobiles of the General Electric Company (AEG). Of the occupants of the airship, two men, lying outside the debris, were found alive; from the ruins the severely wounded Lieutenant Baron von Bleuel was freed. All the other 25 inmates who were found gradually in the wreckage, gave no sign of life from them. 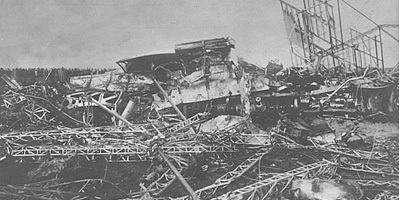 Of the three survivors one died at the accident site, the second died during transport to the hospital Britz, where Lieutenant Baron Bleuel as the only remaining survivor is still layed low with perilous burns. 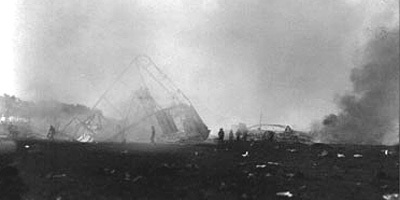 The others located in the airship were still during the crash or at least on impact killed, because most dead showed except burns serious injuries of the trunk and spine, as well as skull fractures. The accident site was immediately cordoned off and guarded military. From the observations results at first, that the cause of the accident must be sought in an inflammation, which did not originate in the interior of the airship, but at or above the front engine car. It will be tried to get through accurate studies of the remnants of the original cause further details. The Navy is faced with in a short time a new, serious accident that has robbed them of their newest airship. She mourns the death of many brave men who gave their lives for their country.